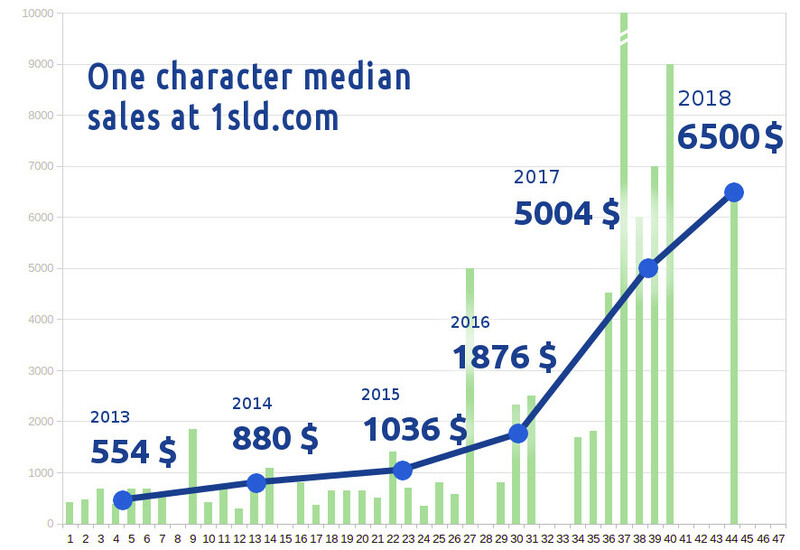 One character short internet domains proved to be a good investment within the last 6 years and we decided to publish the development of sales over our website. This rare domain type makes a very limited asset since any TLD like .de, .uk, .com can offer only 36 such domains in the international Latin1 charset. Letters from A to Z and numbers from 0 to 9. Our latest chart reflects the sales with an amazing jump in 2017 (+166%) and continuing growth in 2018 (+29%). Looking at the complete time we see a growth by +1073% since 2013. Definitely a good investment. An increased interest in China 2016 lead to a situation where prices for 1-number domains outperformed the prices of 1-letters, what was the opposite before. Real 1-character short ccTDL domains are very rare - we estimate less than 2500 of this shortest-type domains worldwide. Each country registry can offer only 36 such domains and most countries are blocking the possibility of registration. Available domains currently often get bought out within seconds when getting free to the market. The domains can also have interesting technological advantages. Twitter for example uses T.CO for making shorter links. In the last years some of worlds biggest companies bought 1-chars including Facebook, Amazon, Google, Visa and many more. There are speculations if they are planning to use it for some new kind of services (read more about here). Last year also famous Elon Musk made headlines when buying back X.com from PayPal. Our numbers do only list regular domain sales up to 10000 USD/domain not including exceptionally high sales that we filtered out. A complete list would show even better growth values. But since exceptional sales are also a matter of luck we decided for a more conservative model for this list that better reflects the general sales trends. For years before 2017 the exceptional sale marker was 5000 USD/domain. Because of the very positive development we had to adjust this to 10000 USD since 2017 and we expect it might be necessary to adjust this once again upwards to 15000 in the next years - but can give no warranties here. This simply depends on the future market situation. Most of our sales were sales to domain investors who try to sell again with profit. Please note - this data show only the sales made through our website and are only a part of the whole market situation. No warranties can be given that growths will continue in future and domains are a high risk investment. But for us in general the 1-character niche proved to be a good one. Data for 2018 might be not complete. For all interested folks here additionally we present also some other sales not only made by our website. The below table shows interesting data for the exceptional - the highest sales by year. At least the official ones (some investors decide to keep the trade confidential). 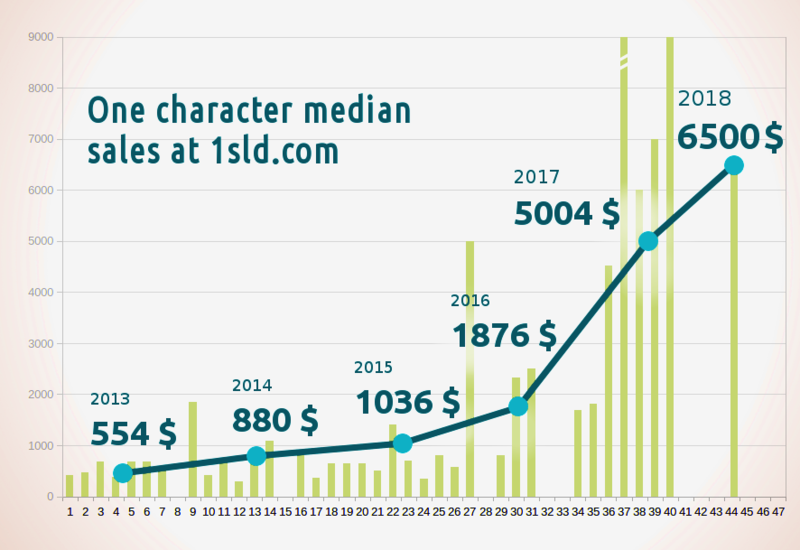 The results show that more ccTLD 1-char domains reached the 20.000 USD level 2016 and performed strong. If we consider the 8.CO as an exceptional sale because of its ".com alternative" popularity combined with an "8" (Chinese lucky number) the difference would be here even stronger. Though if results were mixed with the new nTLDs 2015 top 10 sales would only be little lower due to some very high .TOP sales 2015. Surprisingly some nTLD 1-chars reached very high prices 2016. Still one needs to keep in mind the much bigger open market, often used high premium renewals for nTLD 1-chars and the tons of nTLD 1-chars selling at very low value like 99$ on auctions. This makes investing in that domains less predictable than the shortest very rare and exclusive ccTLDs. Also the technological advantages of having worlds shortest domain do not apply to nTLDs. By the way the highest published sale value ever that we know about has been Z.com that sold at 6.800.000 USD. Because of the unique position of .com and the fact that no new registrations of 1-char .com are possible this prove to be an excellent asset. 1sld.com (1-single-letter-domains.com) is a Germany based website launched 2012. The intention is to offer the shortest domains possible. Impressum & Copyright: © MobileSpecialists.net, opencos.pl, 2010-2013. All rights reserved.